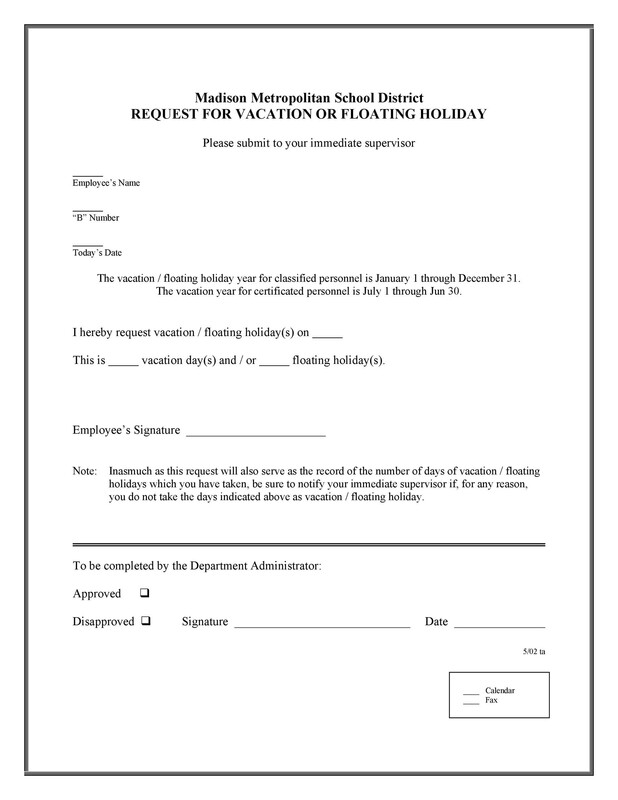 A vacation request form is a document that employees use when if they need to ask for a time off. We all need a break at some point, especially when we work in high-stress environments, or it may be due to any of the personal reasons. 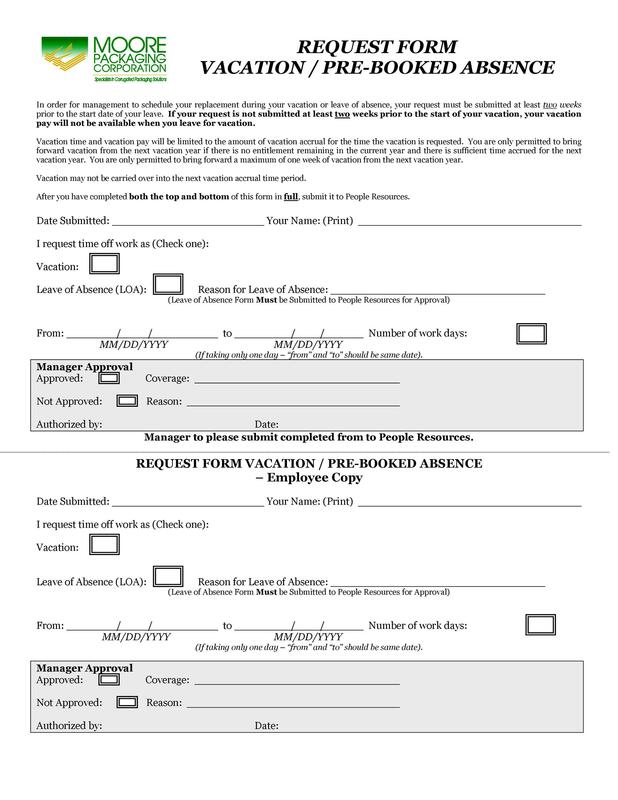 Whether you’re an employee or one of the people who approve vacation leaves at the office, having a vacation request form comes in handy. 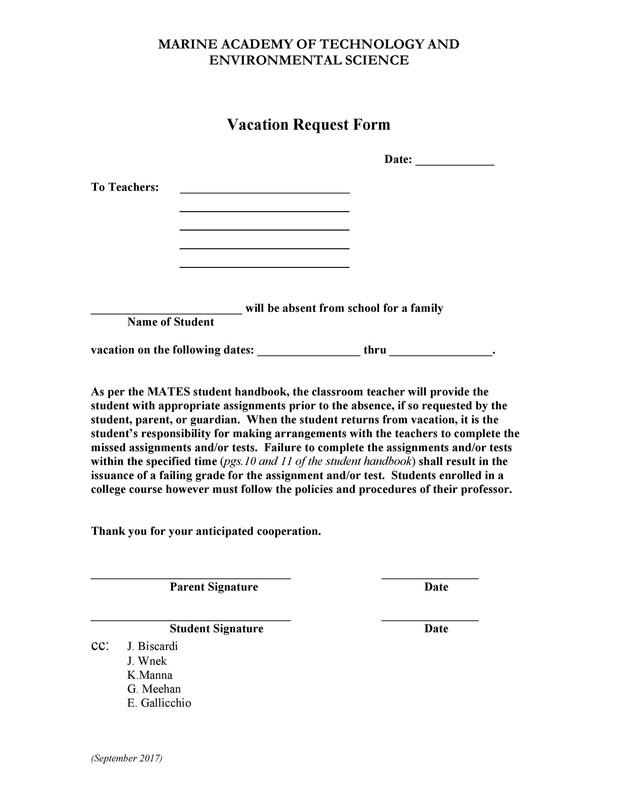 If you’re planning a vacation, you will have to fill up a vacation request form. 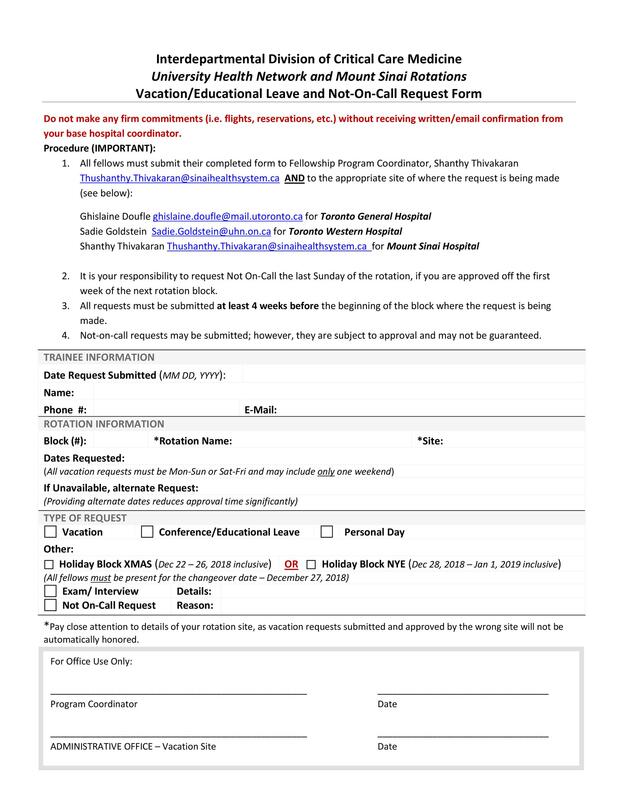 This will make it easier for the HR department to approve your request and deal with your absence, especially if you’re taking more than just a day or two off. 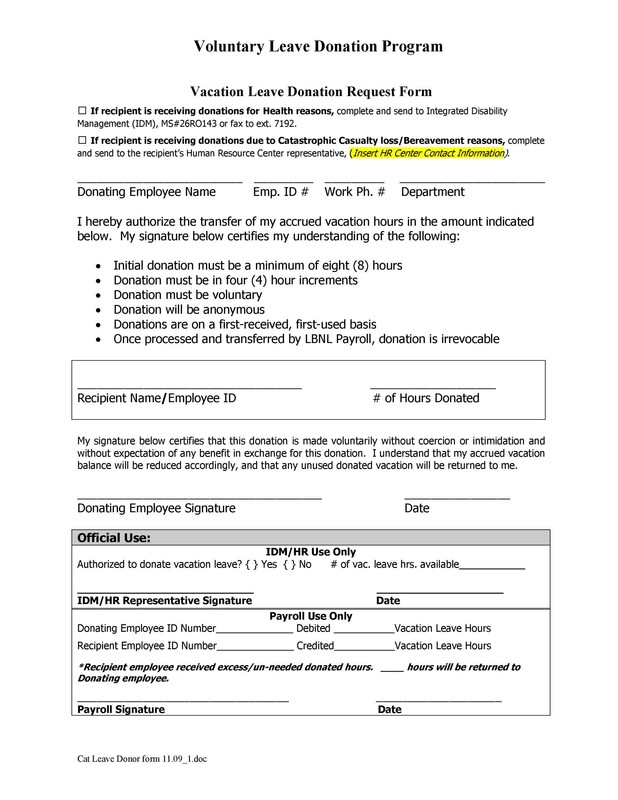 Also, you need to fill up the employee vacation request form for the purposes of salary computation. 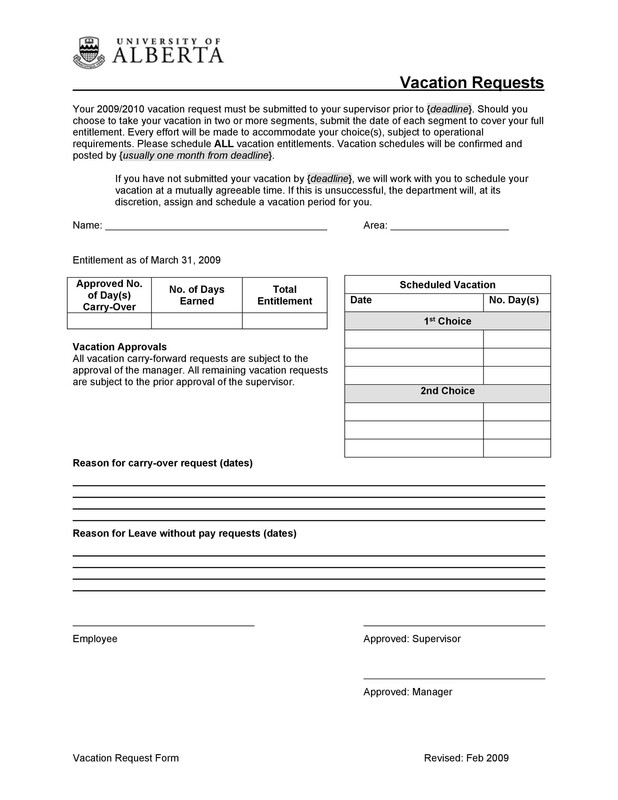 Writing a vacation request letter will give your employer a chance to reschedule other employees work hours if needed. 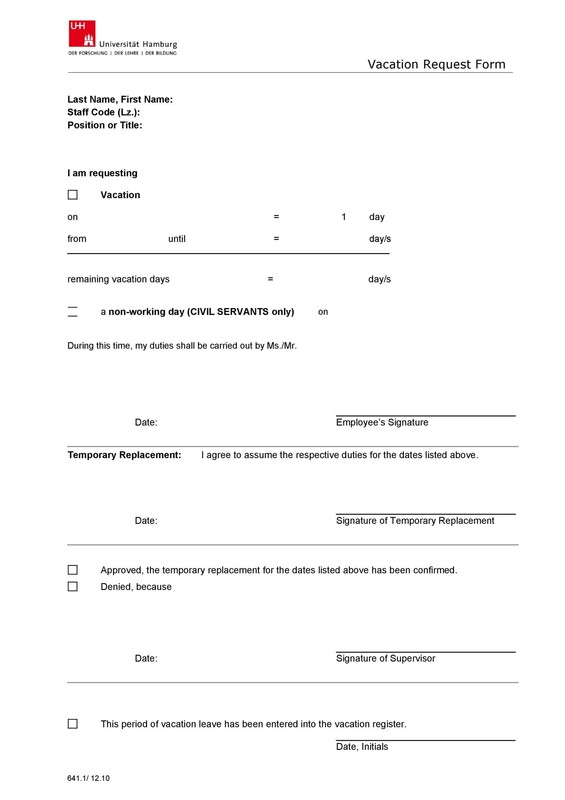 The document will keep both the employee and the employer well-informed about their time. 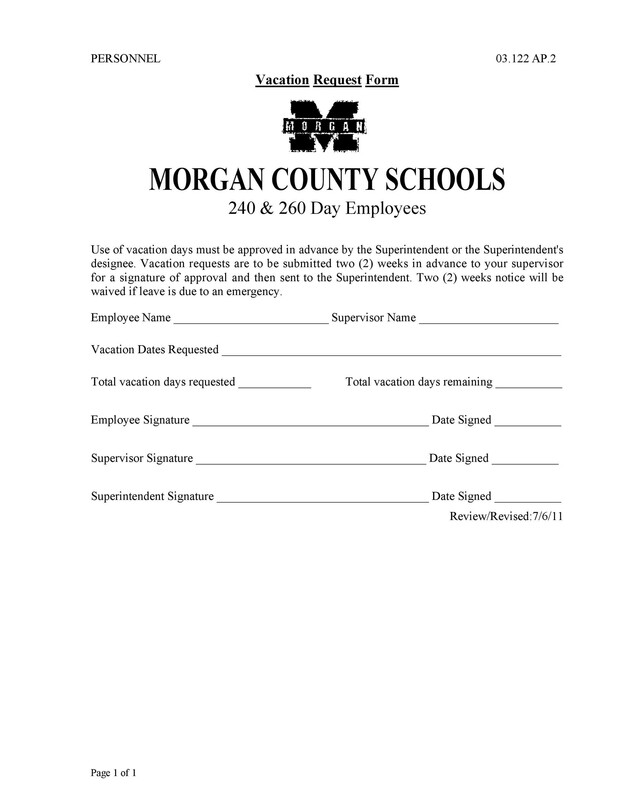 For the HR department, they can use the forms to keep track of which employees keep on requesting for vacations which, in turn, place unnecessary strain on their teammates. 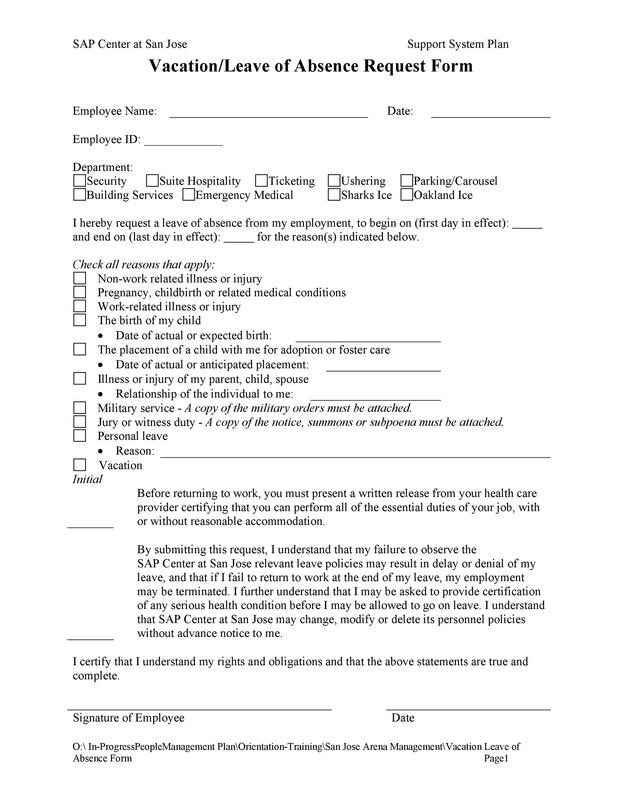 These forms contain accurate information about how much the employer owes his employees. This is very helpful in cases when the employer plans to fire the employee. 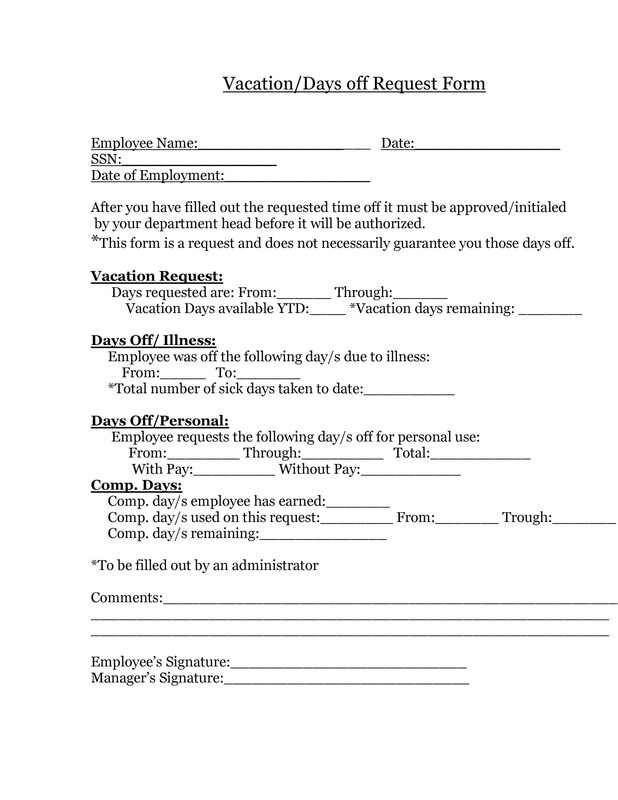 The proper documentation will indicate how many paid vacation leaves the employee should receive upon termination. 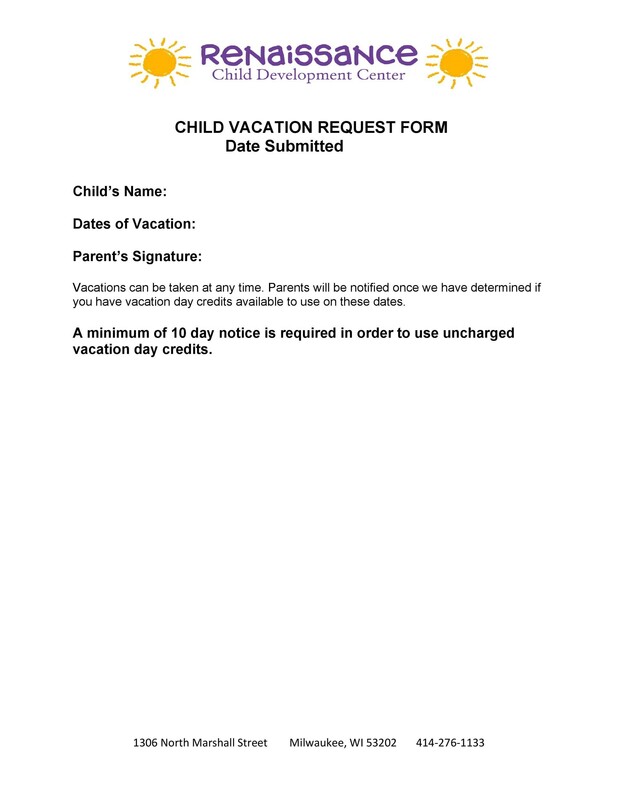 For all these reasons, it’s evident how important vacation request forms are. 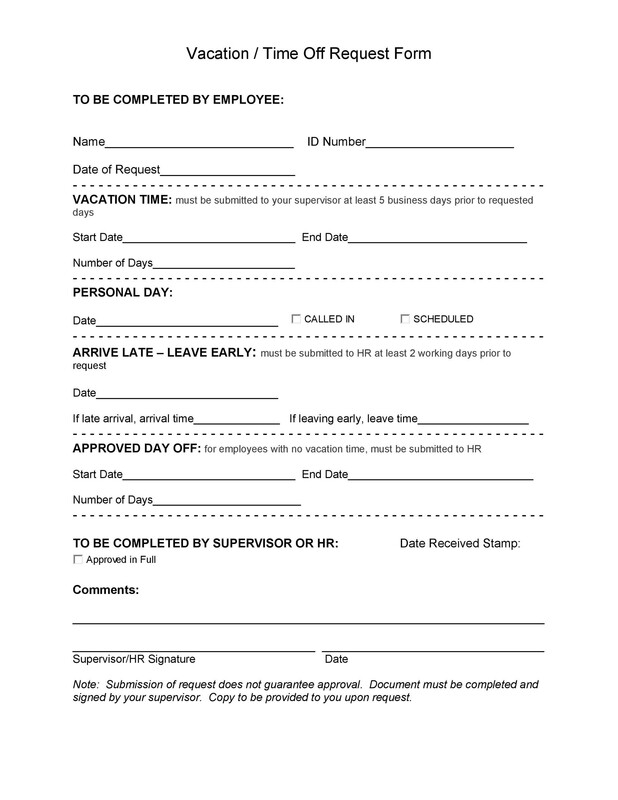 Without these forms, employers won’t know who isn’t at the office because they’ve taken a vacation. This will make it difficult for the office to function productively which, in turn, might create issues or challenges within the organization. 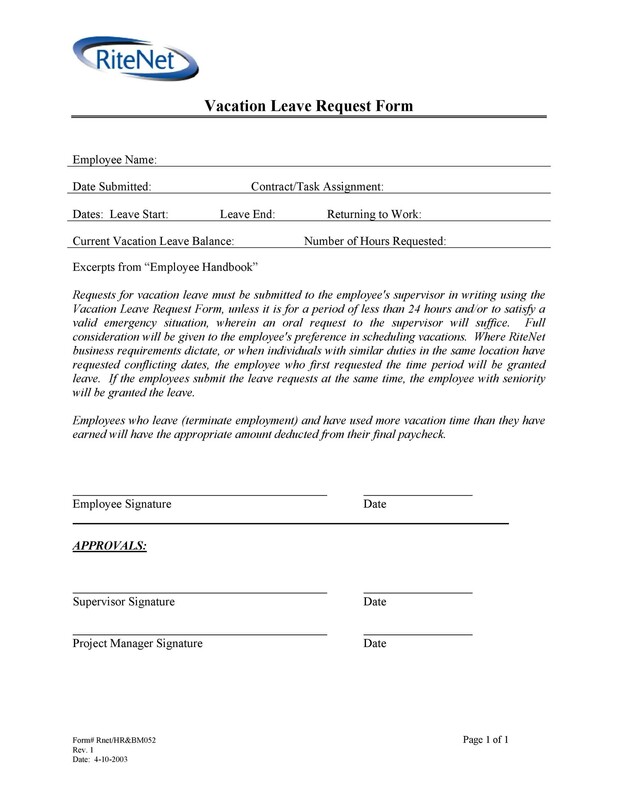 Requiring employees to write a vacation request letter will help them understand that there’s a process which they should follow if they need to apply or request for a vacation leave. 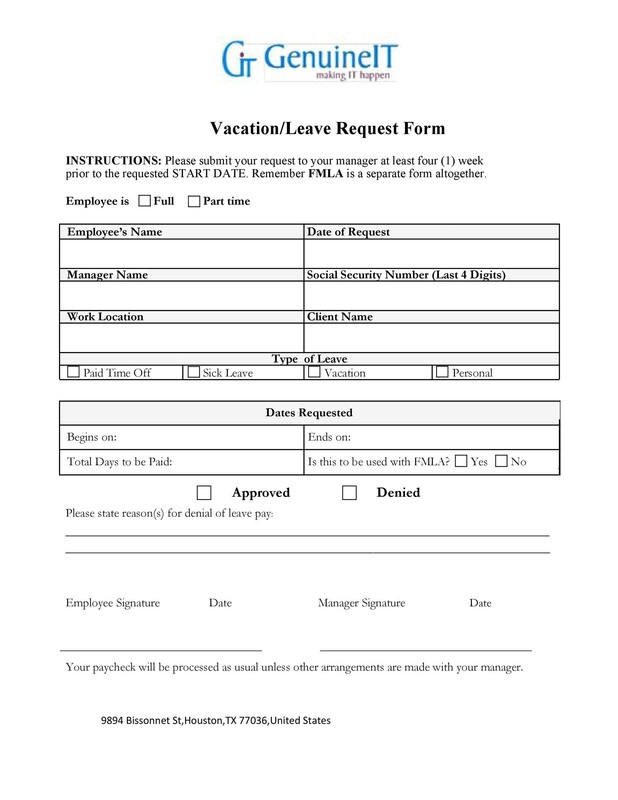 Even though employees have entitled leaves, filling up the form will remind them that they should still follow the regulations of the company regarding vacation leaves. 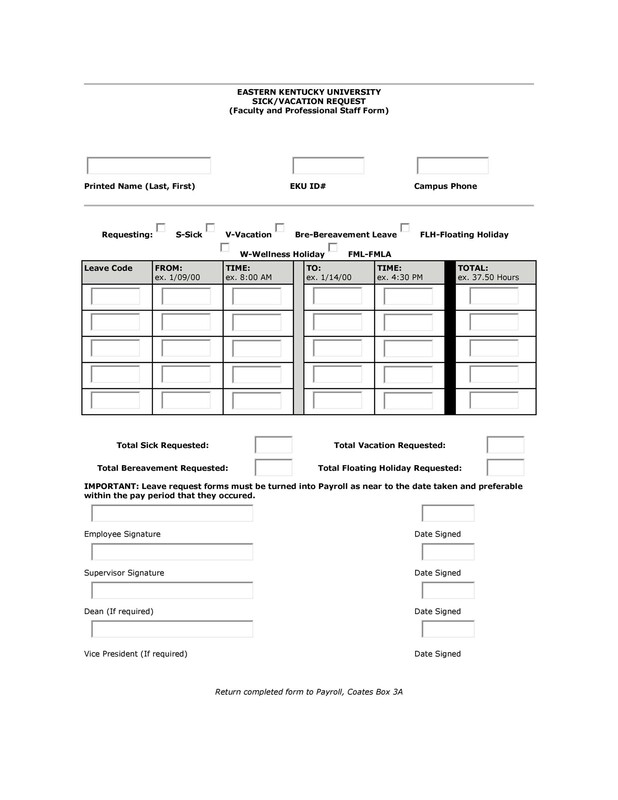 The forms also allow a smooth flow of your work operations. 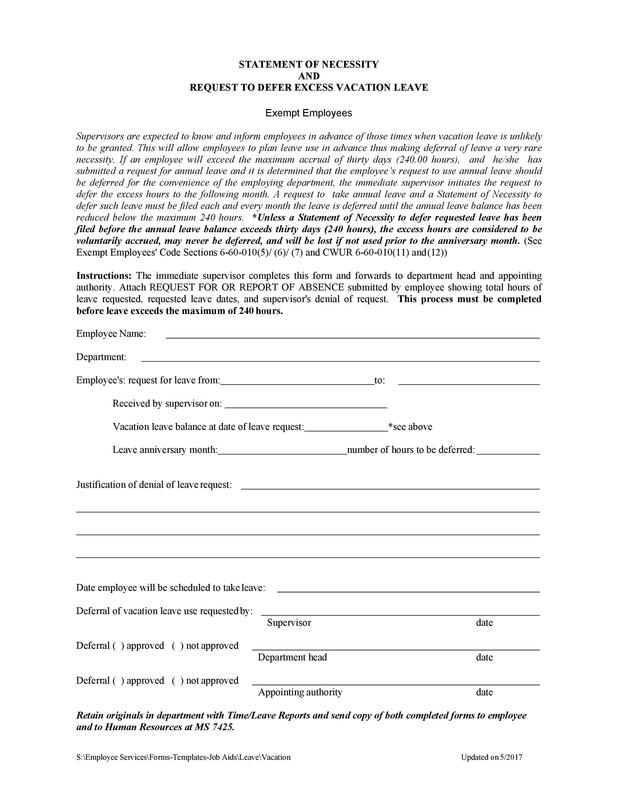 With the document, your superiors can determine whether your request is a feasible one or not. They will either approve or deny your request depending on the current circumstances in the workplace. For instance, if you’re currently understaffed because some of your employees are attending seminars or business conferences, then your request for a vacation leave might get denied. 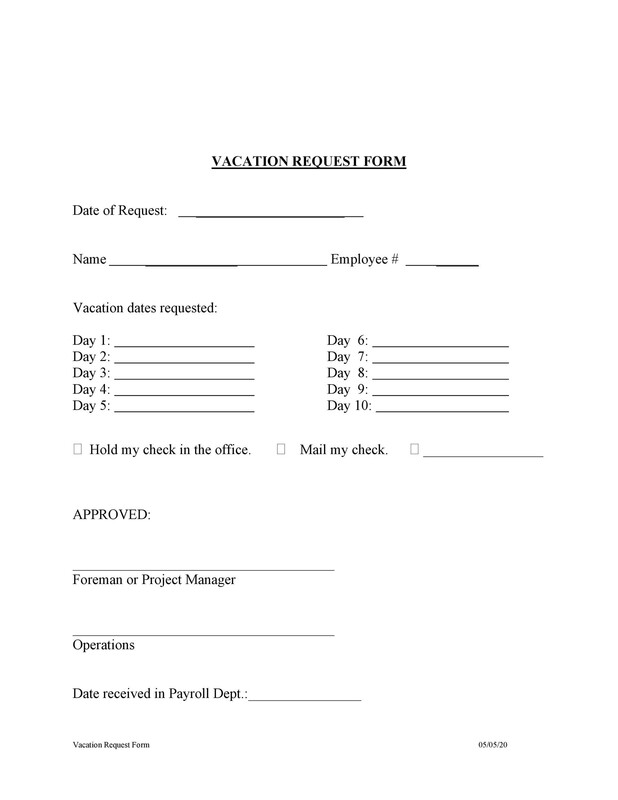 The form can also ensure that the vacations taken by the employees get organized and documented properly. This is a huge help to the HR department, especially in terms of payroll issues. 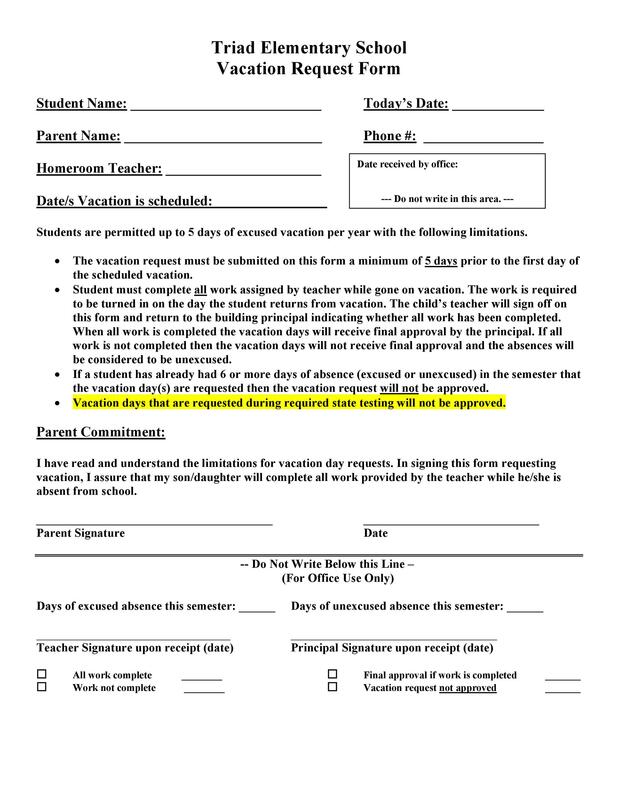 Vacation request forms can help keep the schedules in the office organized and in-sync. 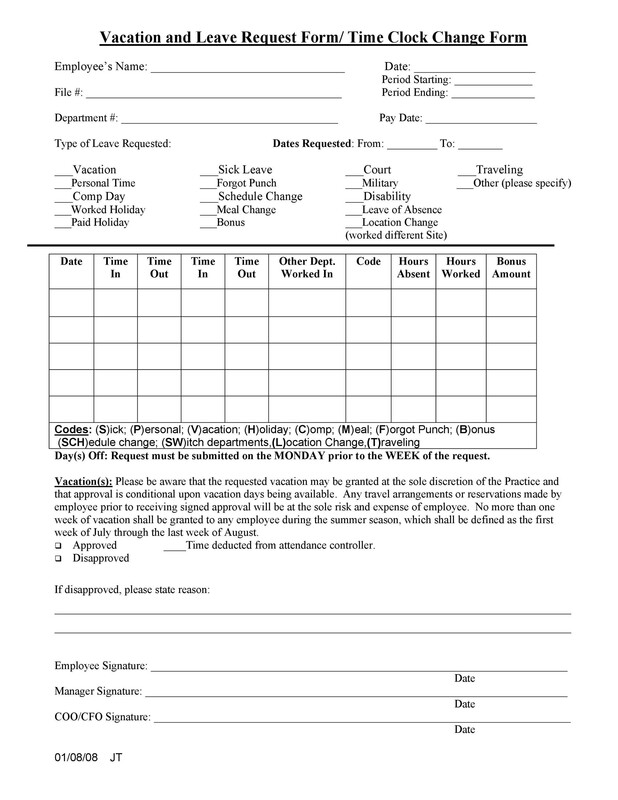 Different businesses have to observe specific leave patterns to keep the office running smoothly. For instance, it’s not unusual for employees to take long vacations during the holidays. Although this isn’t good for businesses, informing employers early on can help them take the necessary measures such as hiring temps for when some of their employees are on vacation. 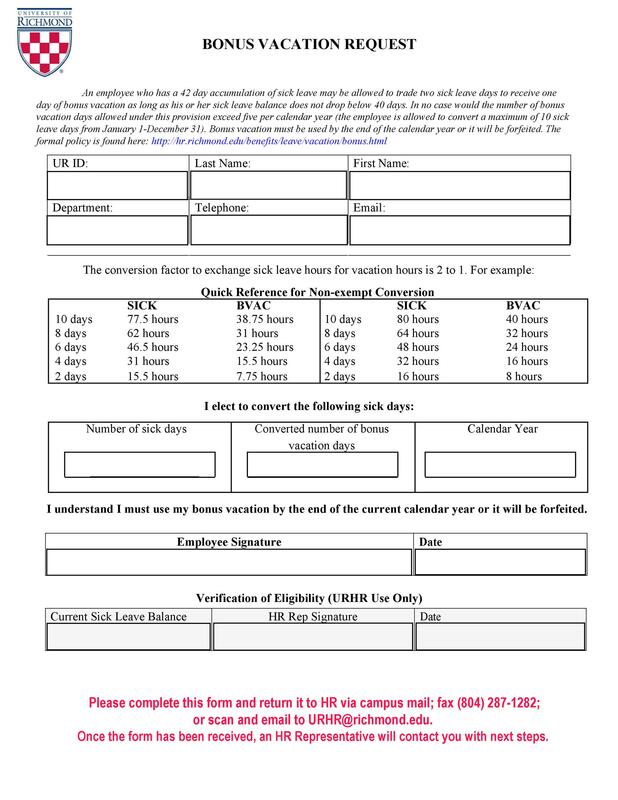 The hours or date of the requested leave. 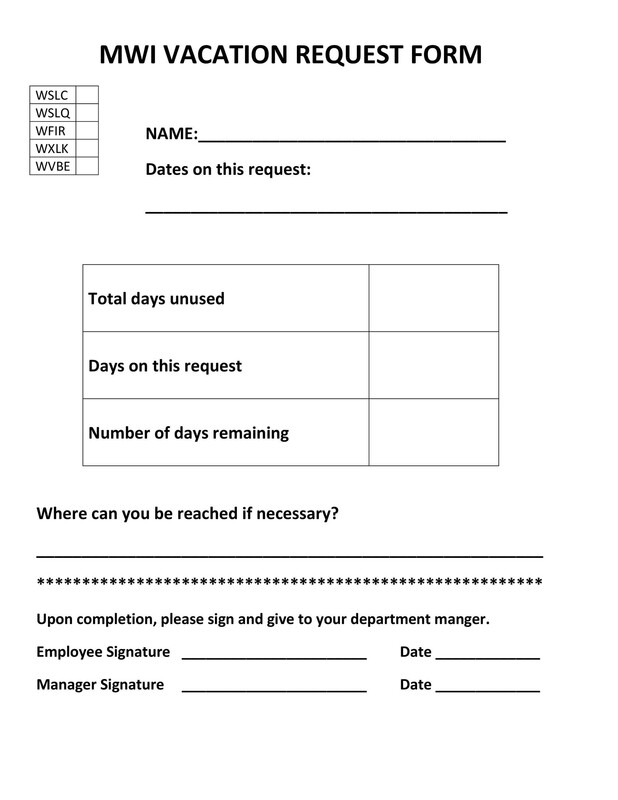 This is the most important part of the form as it will inform the employers how many days the employee won’t come into work. A reminder about how early the employee must make the request. 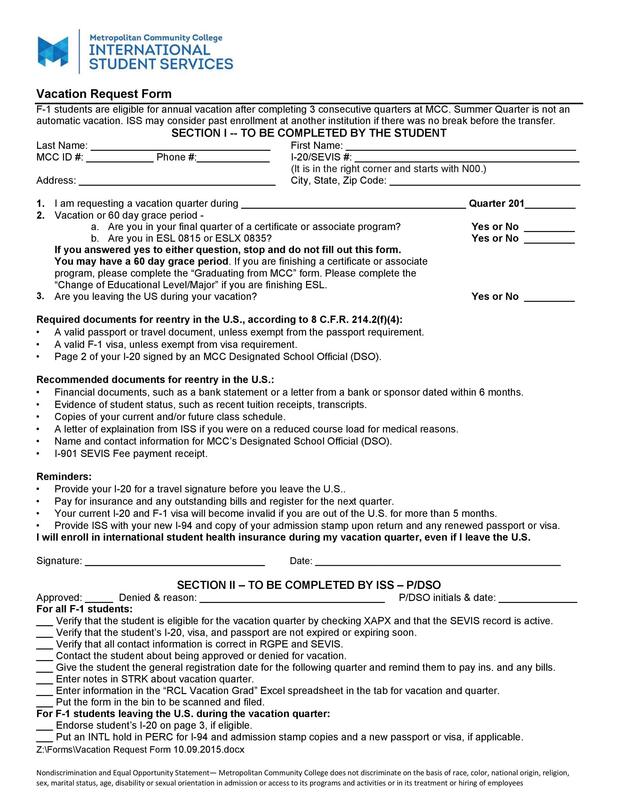 Also, include the process to follow when requesting for a vacation. The date of the request and the date when the request got approved or denied. 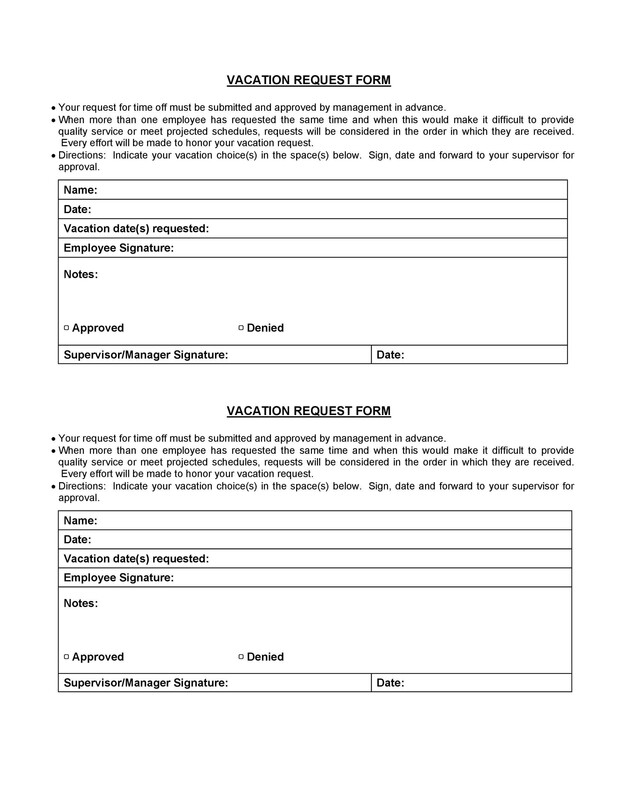 A place for the signatures of the employee and the person who denied or approved the vacation request. 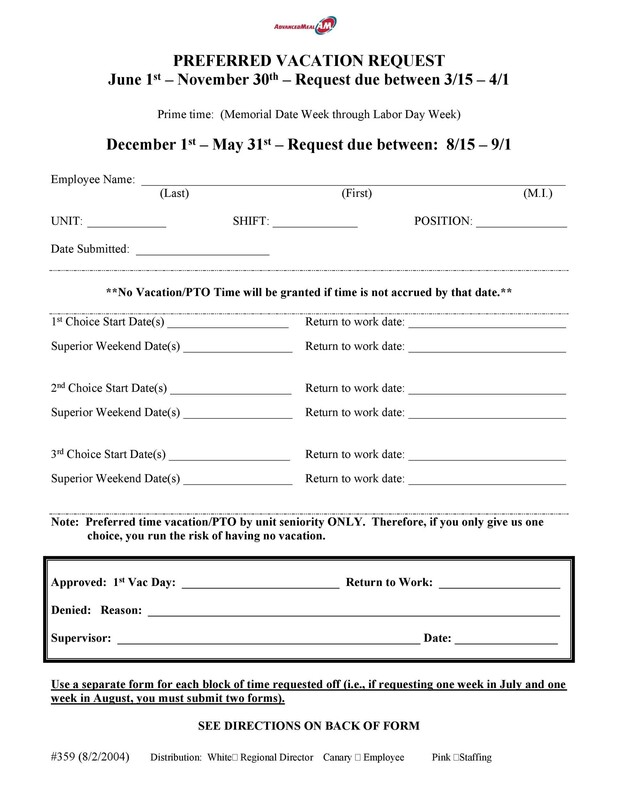 Include a section to remind the employee to record his vacation days on the employee calendar if you have one. 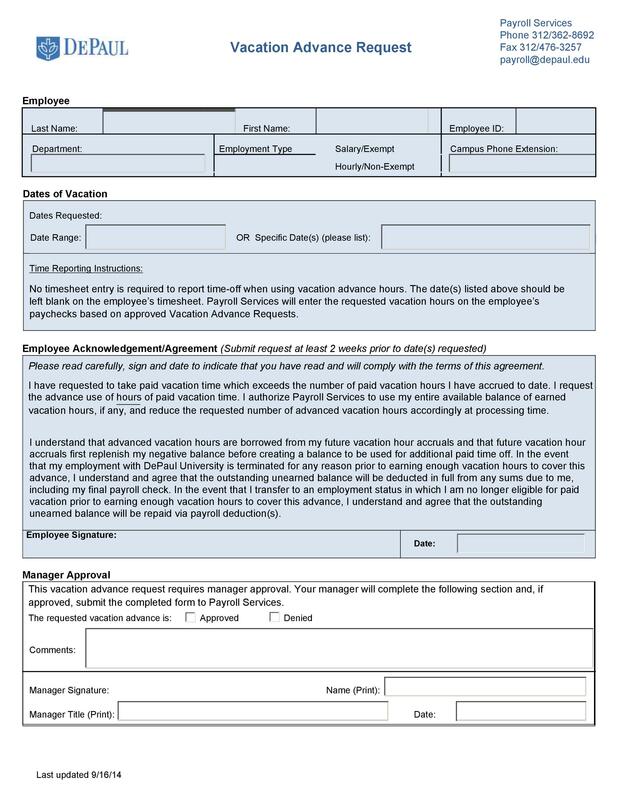 This will help you distinguish paid leaves from unpaid leaves for payroll purposes. Of course, different processes would apply for different types of leaves. For instance, you have to follow a different procedure if you’re applying for bereavement or sick leave instead of a vacation leave. Also, you may have to follow different processes if you want to apply for a paid leave instead of an unpaid leave. Although there’s no standard format for this type of document, including all of these components will make it official. If you’re creating the template for your company, make sure it’s easy to understand, and it contains all of the relevant information. 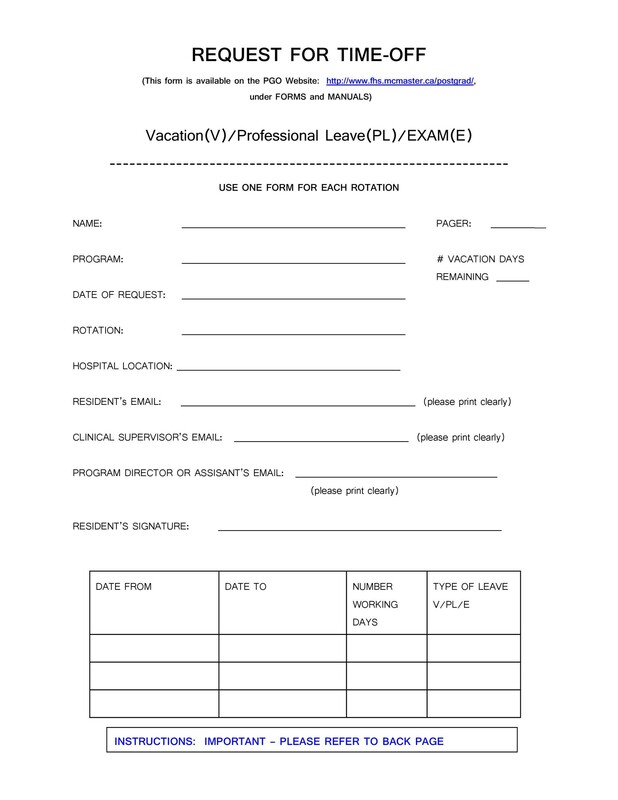 A vacation request form enables employers to keep track of all the vacation leaves of their employers. 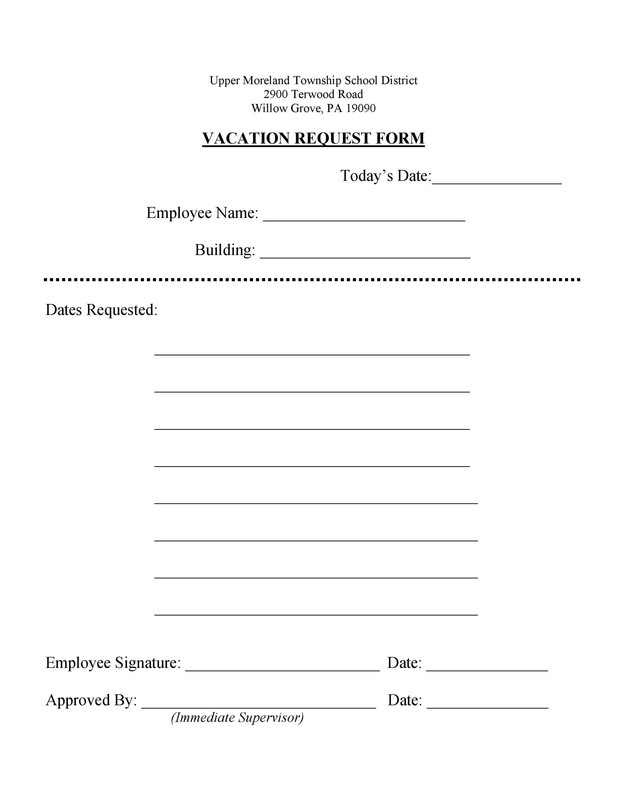 Employees fill up this form to provide their employers with information about their vacation. This is very important, especially if you don’t have a lot of employees in the office and when one takes a long leave, it has a huge impact on your productivity. 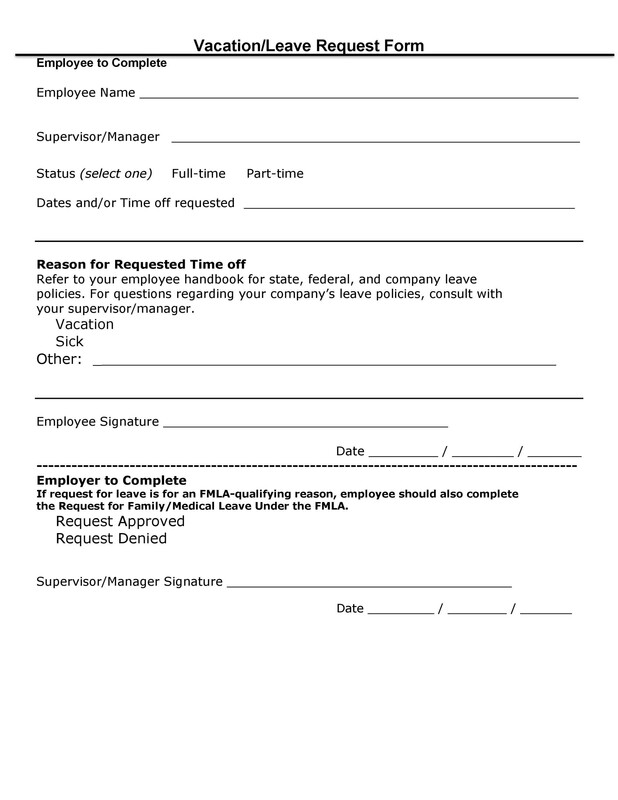 The only reason why you would use this form is when you need to take a vacation leave. It’s important to provide this information to your employer so you won’t get into trouble at work. 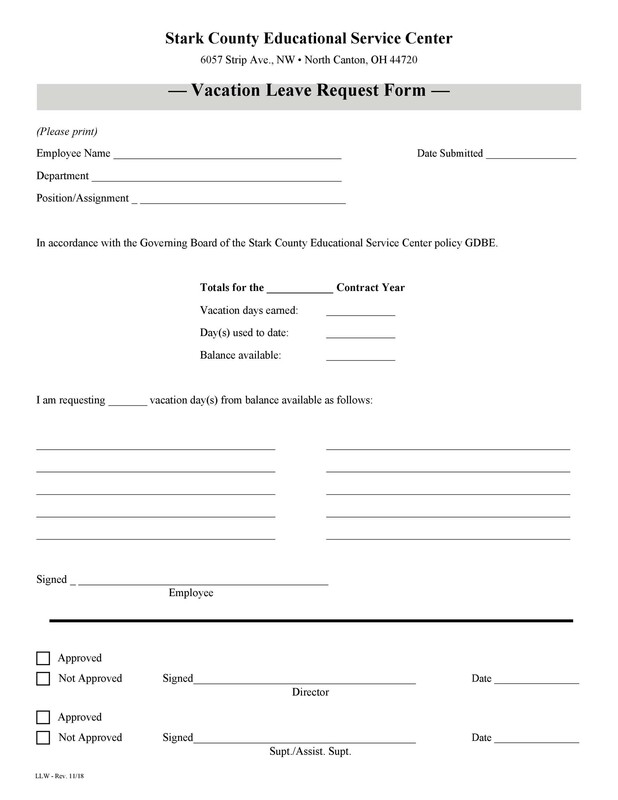 Filling up this form is crucial because it will be the employer’s discretion whether or not he will approve the request. Just because you’ve accumulated a lot of vacation leaves, that doesn’t mean that when you make a request, it will get approved. 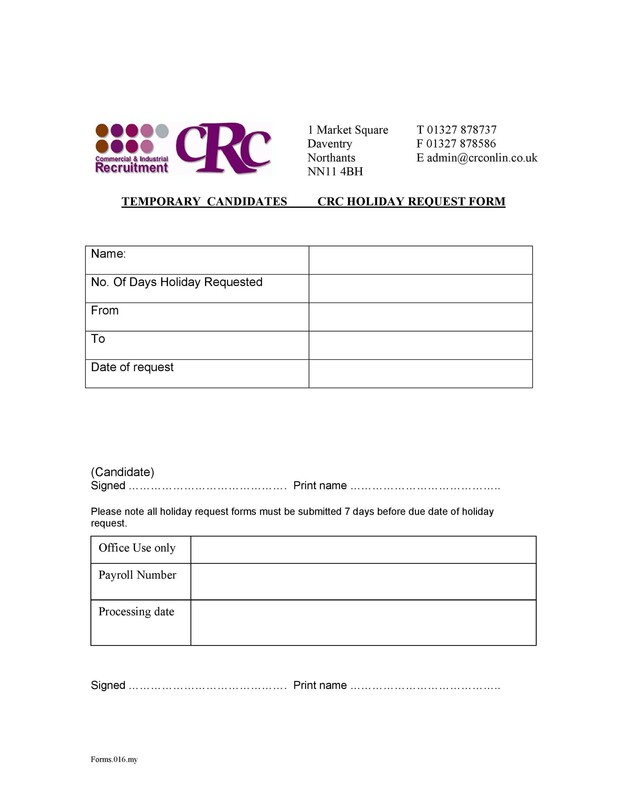 Only when you have filed the request will it get subjected to your employer’s decision. 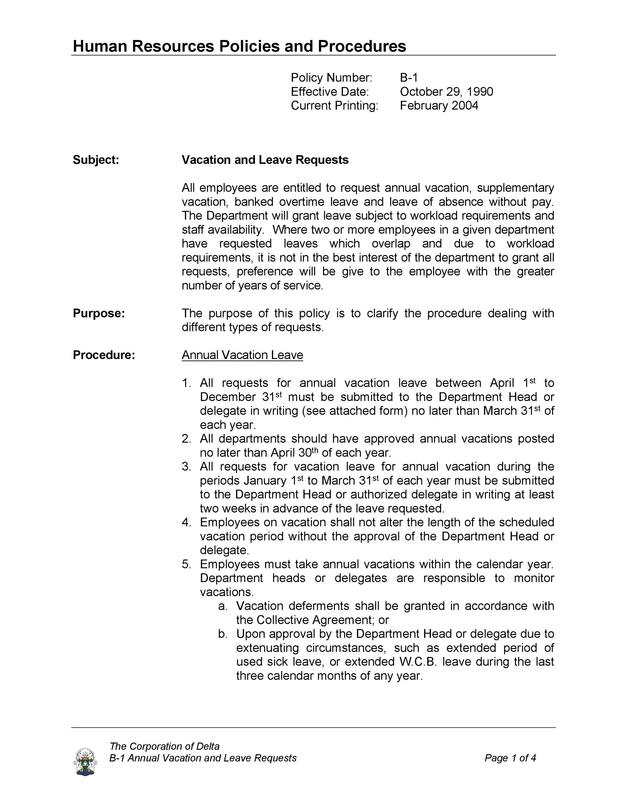 The document serves as an official notice whether it gets approved or denied. 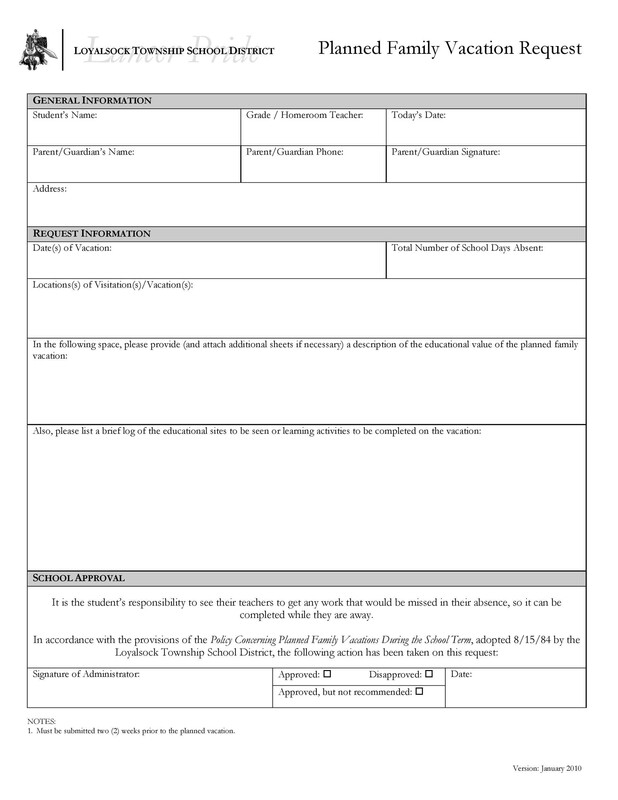 If you find yourself in such a case, make sure to fill up the form and submit it in a timely manner. 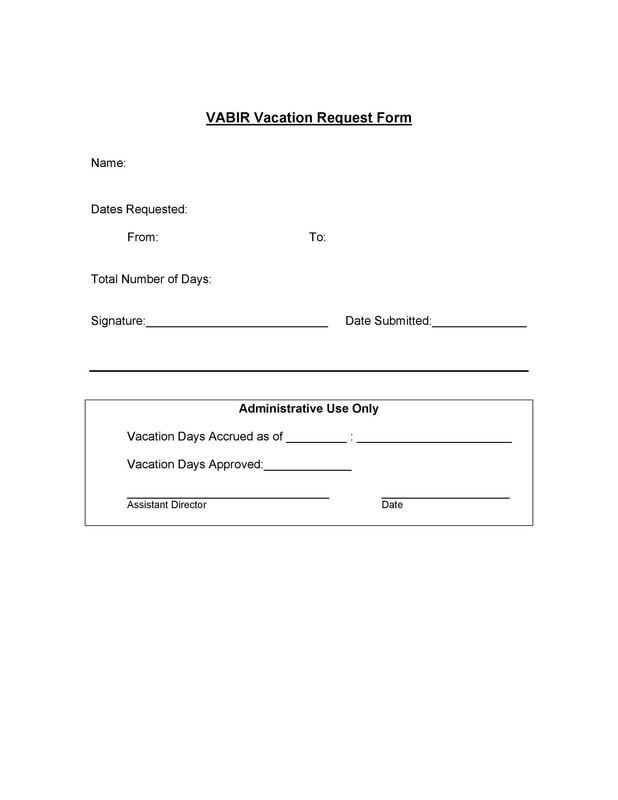 Creating your own vacation request form is much easier than making your employees compose a vacation request letter each time they want to take a break from work. 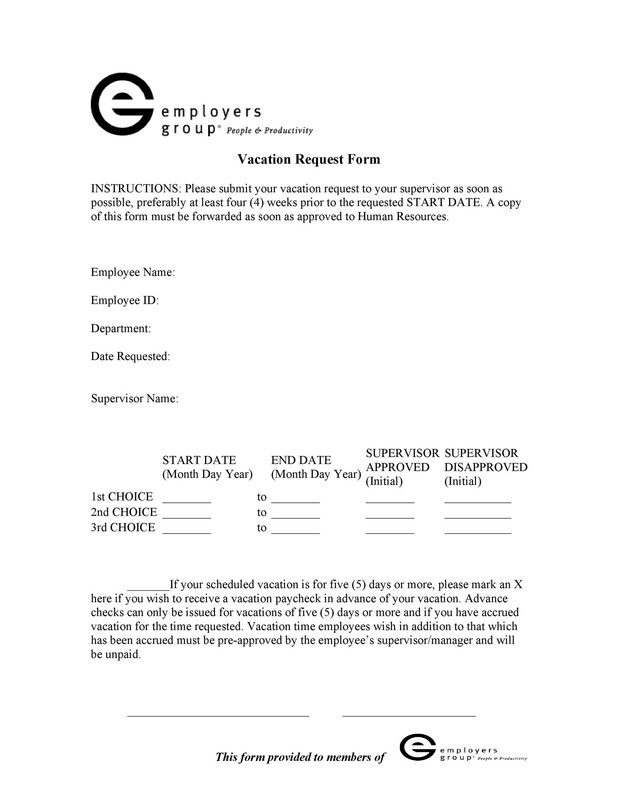 It’s your employee’s choice to fill up the form and request for a vacation leave. But you should remind them that even when they submit the form, your request won’t always get approved. 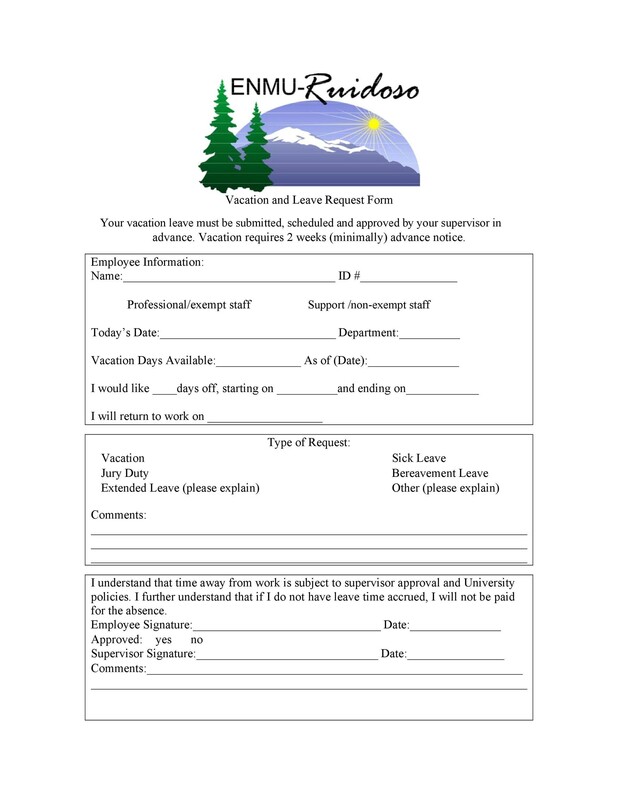 All of your employers should understand that there may be times when you cannot approve their vacation leave request for good reason. This is especially true if the time they want to take a vacation doesn’t align with the needs of the company. 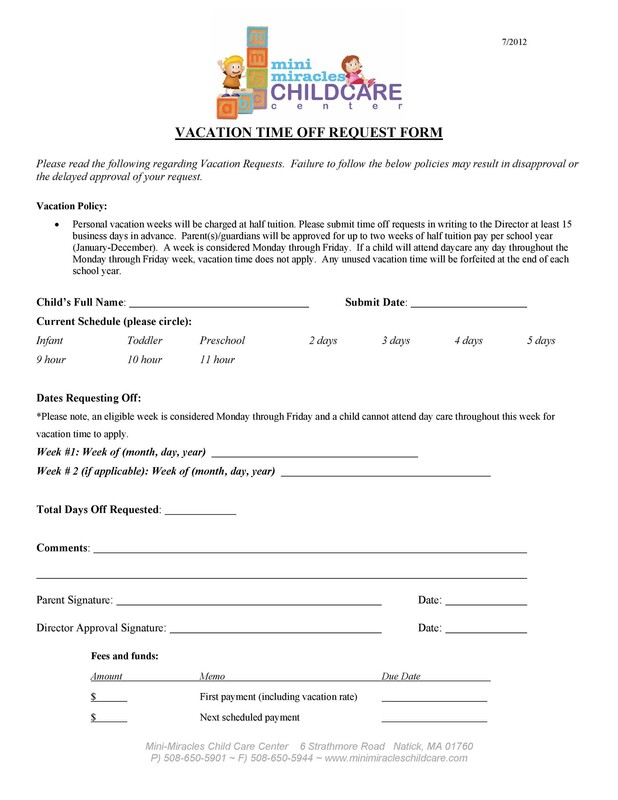 Make sure that all of your employers fill out the form for a vacation request completely and properly then submit it in a timely manner. 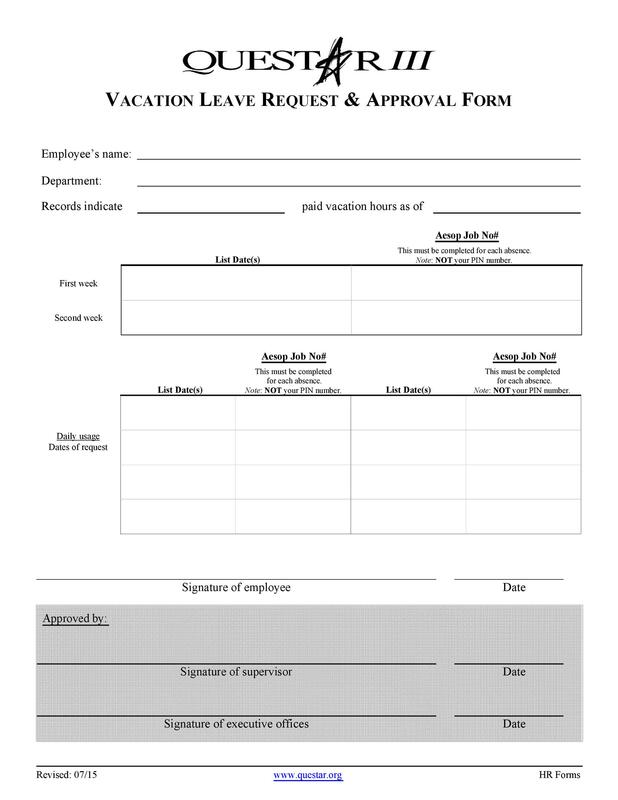 Provide your employees with information about the rules, regulations, and processes they should follow when requesting for a vacation leave. Also, inform them on how to use the form properly and how to file it whether it’s approved or denied. 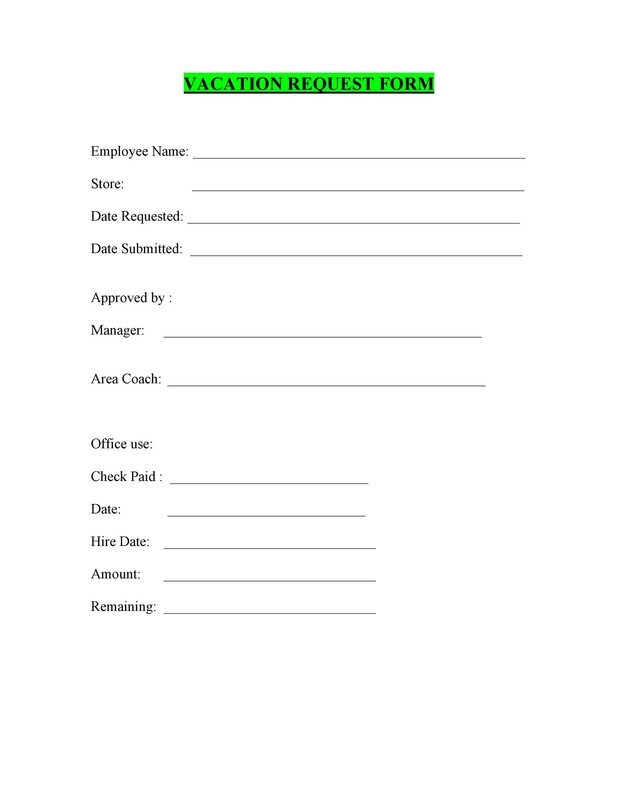 Give your employees a specific time frame by which they should have already submitted the form for approval. 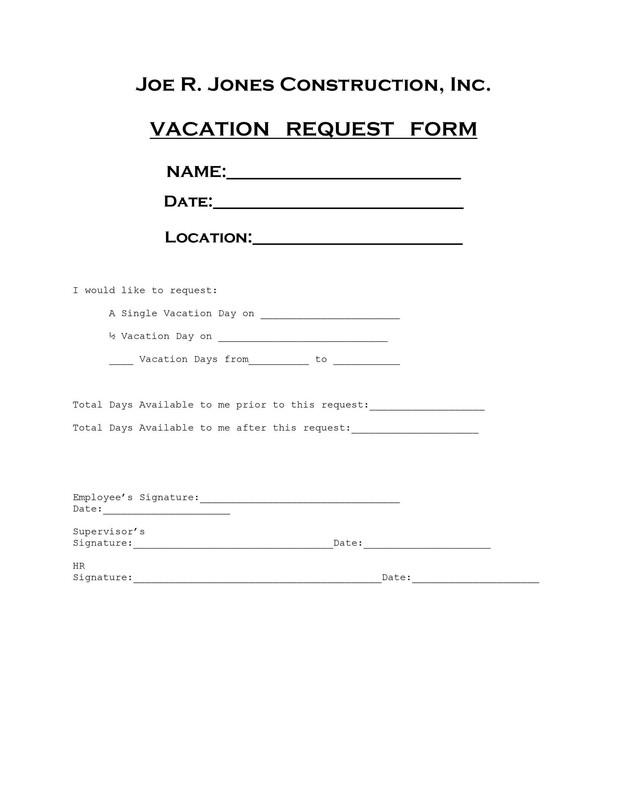 Organize all of the vacation requests of your employees. Make sure that even though your employee will go on vacation, the office has adequate manpower to maintain smooth operations. 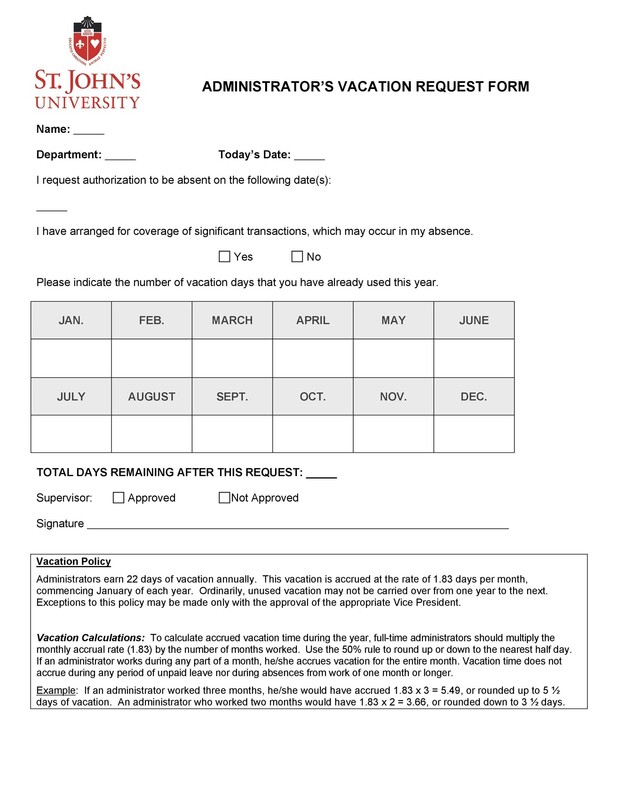 Whenever you receive a form, keep it in a file along with the others. 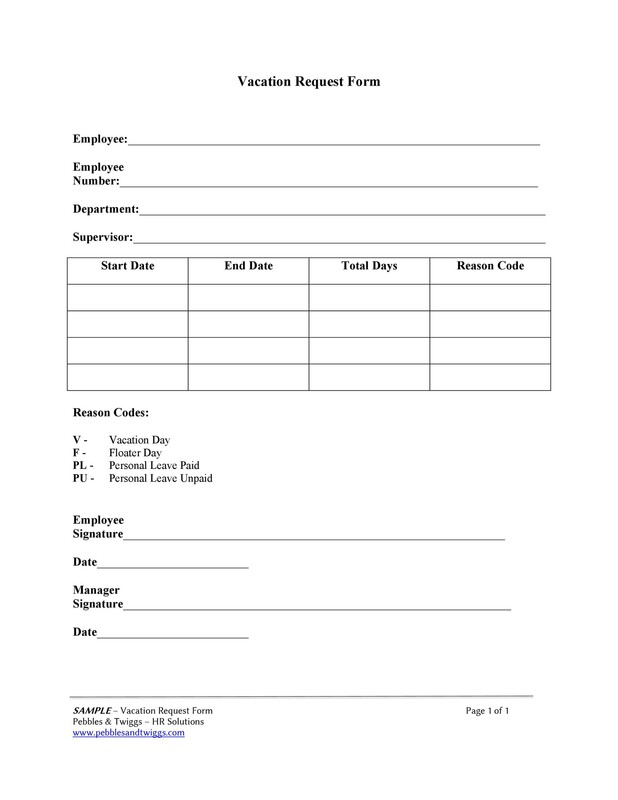 Then review all of the forms collectively and try to come up with an employee calendar which shows when each of your employees will be out of the office. 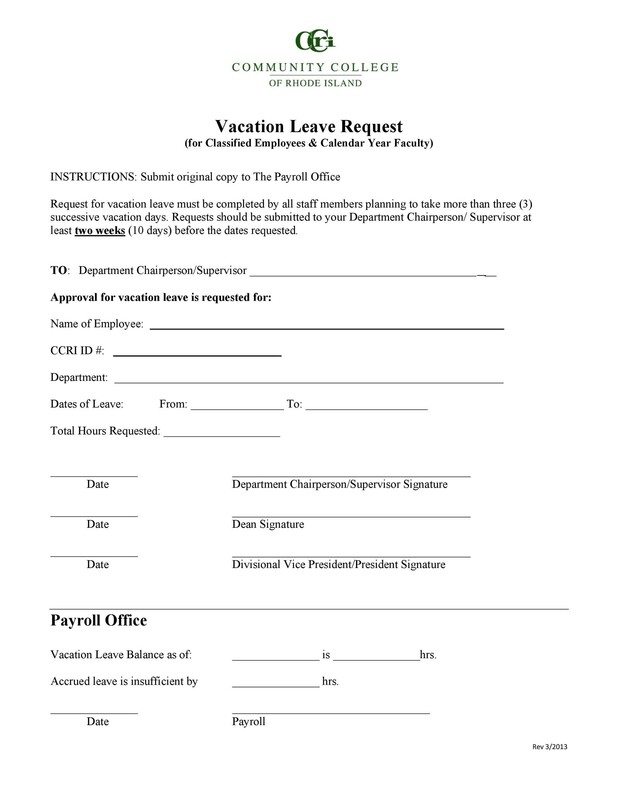 This will help you decide if you can approve any vacation leave requests that come in. 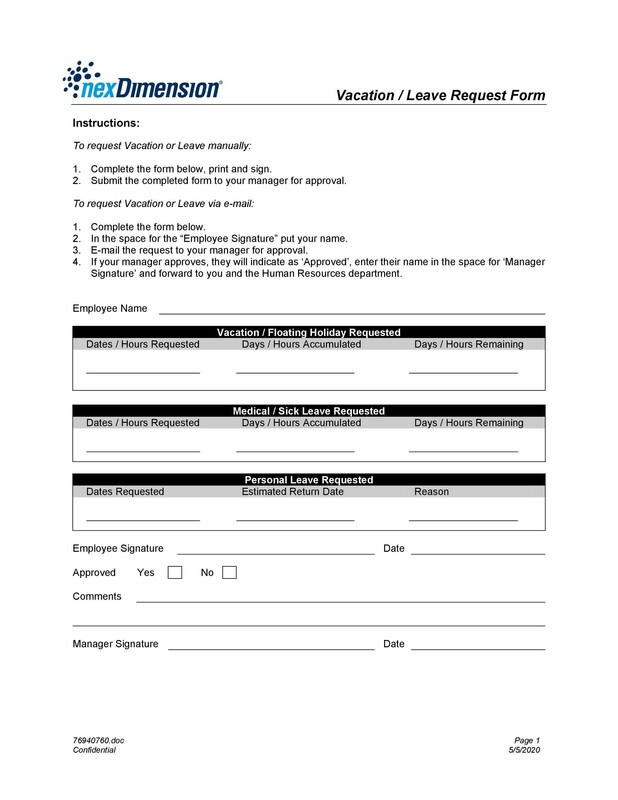 Before you approve a vacation request, deal with any existing staffing issues. 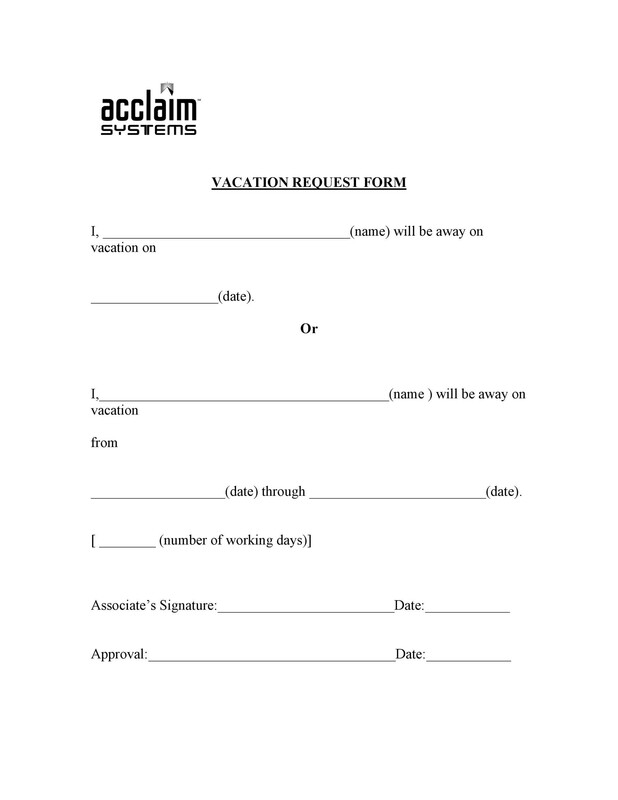 You need to know about the demands and the needs of your business before you allow someone to take a vacation. Even though employees have vacation leaves, if they have some pending work which needs urgent attention, you can’t approve their request. 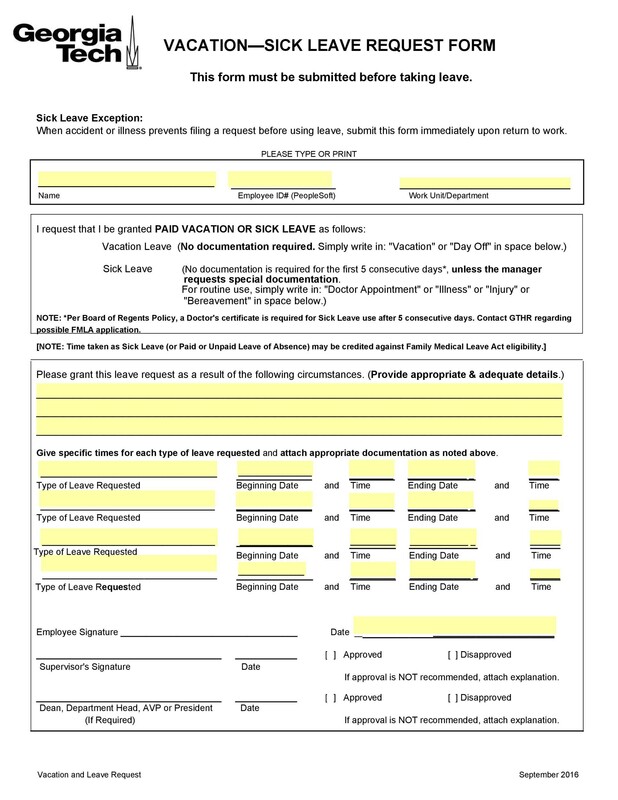 Make the most out of the form by preparing it for your employees who haven’t used all of their leave credits yet. Do this by making simple schedule changes and by talking to your employees about when they would like to take their vacations. This would give the other employees a chance to work overtime if they need the extra income.